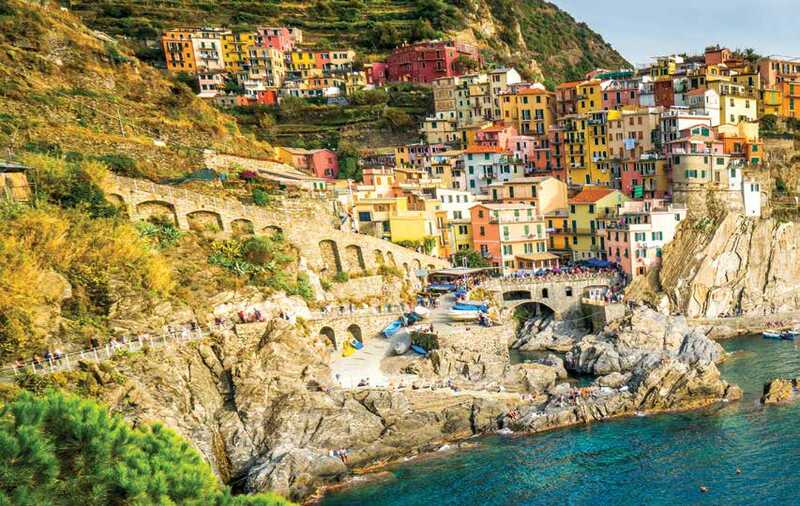 A visit to Italy’s charming, jewel-colored Cinque Terre region will capture your heart and revitalize your spirit. Dotting the rugged Northwest Ligurian coast, this remote portion of the Italian Riviera contains five-centuries-old fishing villages stretching languidly between Genoa and Pisa. 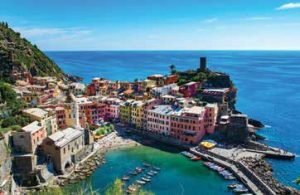 Its name, in Ligurian, means “Five Lands.” Perched high above the boundless Mediterranean, these towns, north to south, include Monterosso al Mare, Vernazza, Corniglia, Manarola, and Riomaggiore. Each possesses its own dialect and other unique qualities worthy of exploration. 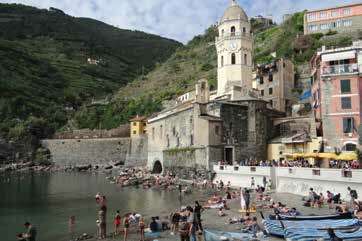 The popular Monterosso al Mare has the biggest beach and grandest assortment of hotels. It is also the only town that allows cars. The resort area is separated from the historic old town by a tunnel under a medieval castle. Visit the Church of San Francesco, with its impressive Van Dyck crucifixion painting. Sunbathe and stroll along the romantic promenade then catch a golden sunset at a seaside bar with locals and fellow travelers. Head south towards beautiful Vernazza. Climb its mountainous terrain past olive trees and stunning terraced vineyards dug right into the landscape to the shrine of Nostra Signora Di Reggio (Our Lady of Reggio). Visit the ancient Doria Castle, 14th-century Santa Margherita d’Antiochia Church, and 16th-century Belforte Tower. 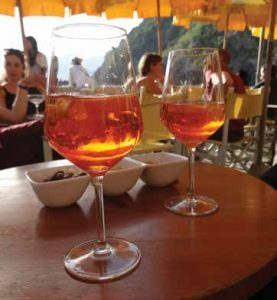 Toast the day under a shady umbrella drinking refreshing Aperol spritzers by the sea. Corniglia is the area’s smallest, most-remote village. 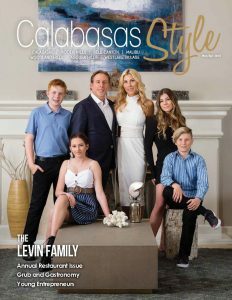 Still, it offers a cornucopia of culinary delights with more than 20 restaurants along its winding, cobblestone streets. It is the only town unreachable by boat. You can, however, take the train to this enchanting spot. The second-smallest town, Manarola, is no less incredible, with its craggy shores, sweet Sciacchetrà wine, ancient relics, and revered hilltop cemetery, boasting views of the Italian coastline and timeless Mediterranean. Nestled in a valley, the easternmost Riomaggiore is alive with medieval churches whispering tales of ages past and authentic local cuisine, including delicate anchovies fished daily from nearby seas; focaccia bread, which originated in this region; and pasta al pesto, created lovingly with local basil, garlic, pine nuts, and olive oil. Drink in the scenery along the tiny harbor. also visit via cruise ship or train through long tunnels first carved during the 1870s. Whichever way you arrive, you’re likely to leave with one word in mind: magnifico!